I was introduced to the 12 Days of Christmas type of workout in Booty Camp. I love it because it’s a quick (this one took me 20 minutes), full-body workout, and it’s easy. Easy in that it’s just 12 exercises that you repeat over and over, so you don’t have to remember a complex sequence. It’s also flexible – you can pretty much put any 12 exercises you like in there – you can do a full-body workout, or focus on legs or arms… so the basic format is useful over and over again. So, what is it? Well, it’s a ladder-sequence modelled on the old 12 Days of Christmas song. You know – ‘on the first day of Christmas, my true love gave to me…’ then each day the recipient gets something new, plus each of the presents from the day before. 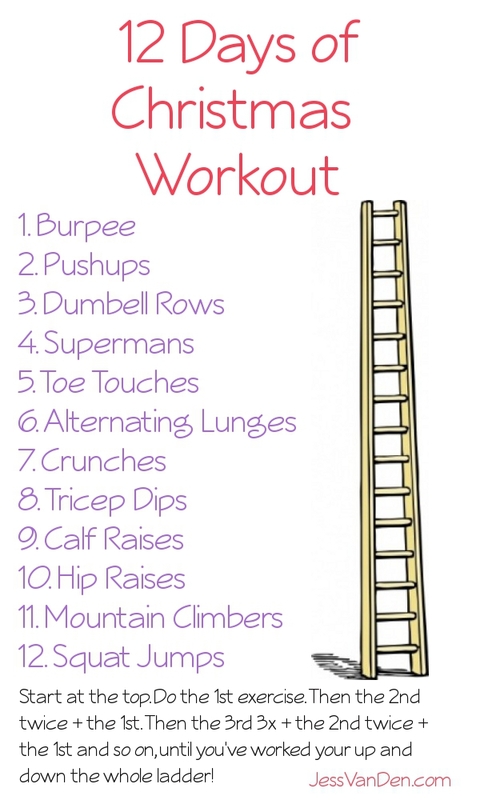 So, you choose 12 exercises, then work your way down and back up the ladder. It’s deceptively effective. When you start out, it feels really easy… but by the time you do that last lot of exercises you’ll be sweating like crazy, and feel pretty worn out! This took me about 20 minutes to do, and I didn’t race through them. I’ll definitely be adding this in to my regular repertoire – I’ll probably come up with a few more full-body versions, then a couple of upper-body/core/lower-body versions, too. I’d love to know if you’ve given this type of exercise a try – please share if you’ve got your own version of this or seen a good one somewhere! 20 Minutes is pretty good, and this is a nice and very varied exercise program. It is also easy to swap out a few of the exercises for even more variety in your workout program. I am looking forward to your updated version as well.